school house. He has also served as township treasurer of Elyria township. Mrs. Adams died, Octover [sic] 28, 1901, on the old home farm, deeply mourned by many friends and her surviving husband and two children. They were the parents of three children, named as follows: Eliza J., wife of Eli Morris, has ten children, and lives in Valley county; John C., who is married, and resides in Oklahoma, has six children; Hattie A., who died in 1897, is survived by her husband, Harry Miller, and two children. Mr. Adams, in his first Nebraska years, worked at Fort Hartsuf, the United States post, which was situated on the other side of the river, he having to wade the river to and from work. The first five years in Nebraska, Mr. Adams lived in a log dugout. When a frame house was to be built, He hauled the logs for the rough timber to a mill on Jones' canyon, forty miles away, and then hauled the lumber back again over the same road. The finishing lumber was sawed from pine trees, hauled from many miles to the west. Such were some of the difficulties encountered and overcome by the early pioneers. Mr. Adams has passed through all Nebraska's history, and, during his residence here, has gained the friendship and esteem of all. William Bates was born in England, March 4, 1848, and was the youngest of sixteen children in the family of Edward and Mary Bates, coming to the United States, landing in Portland, Maine, about February 5, 1867. Mr. Bates received his early education in England, and lived in France for a year prior to his arrival in the United States, after which he first went to work on a farm in Champaign county, Illinois, and in the summer of 1870, came to Nebraska, but in the fall of that year, returned to Illinois. In the summer of 1871, Mr. Bates came back to Nebraska, making permanent location in Madison county, where he took up a homestead on the south half of the northeast quarter and the north half of the southeast quarter of section fifteen, township twenty-two, range four, in Emerick township, which was his home until June, 1877. In the fall of that year, he went to Battle Creek, Madison county, doing general work until accepting a clerkship in a drug store. In the winter of 1879, upon the advent of the railroad, Mr. Bates started in business for himself, his original capital being about fifty-seven dollars, and continued in the general mercantile business, with increasing stock and business, until 1890, at that time going into real estate, loans and insurance. Mr. Bates was village clerk of Battle Creek four consecutive years, and also occupied the office of village treasurer for two years. In the fall of 1897, he was nominated for county judge of Madison county, on the fusion ticket, and has remained in that office until the present date, being elected and reelected seven successive terms in a republican county, Mr. Bates having democratic leanings. Mr. Bates is actively identified at all times with the political, educational, moral and social life of this portion of Nebraska. On October 20, 1885, Mr. Bates was married to Miss Mary B. Kost, of Battle Creek, at the home of her father, Adam Kost, an old-time pioneer of Madison county. Mr. and Mrs. Bates have had seven children, five of whom are living: Herbert, employed in the chief dispatcher's office of the Union Pacific railroad at Omaha, and John F., Lawrence A., Charles V. and George Washington, residing under the parental roof, and attending school. Judge Bates is a popular official of Madison county, and is the only member of his immediate family that came to America, so far as he knows. Samuel L. Cannon, a veteran of the civil war, and one of the very early settlers of Nebraska, has been instrumental in many ways in furthering the interests of the state, where he passed through the trying experiences and discouragements of early frontier life. He never lost faith in the future of the region where he had located, and time has justified his judgment. Mr. Cannon is a native of Jackson county, Missouri, born November 9, 1847, a son of Joseph T. and Phebe (Jordan) Cannon, and was the next to the eldest of their four children. His father was-born in Ohio, of Scotch and Irish extraction, and his mother was born in Virginia, of German descent. He died in Cass county, Nebraska, in July, 1883, and his wife in 1871. Joseph T. Cannon served as a member of the first state legislature of Nebraska, being a member of that body during 1869, 1870 and 1871. He had settled in Otoe county, July 5, 1855. He was a minister of the Methodist church, and was prominent in religious work in Nebraska, after locating there. Samuel L. Cannon has one living brother, William T., of Broken Bow, but the other two children are deceased. 1863, he purchased one hundred and sixty acres of land in Cass county, and began to operate this farm, which was located near Union In the winter of 1869 and 1870, he moved to Lincoln, where for about five years he was connected with the United States land office. On December 9, 1862, Mr. Cannon enlisted in Company H, Second Nebraska Cavalry, and received his discharge at Plattsmouth, Nebraska, in December, 1863. He took part in several engagements with the Indians of northern Dakota, where many settlers had been massacred, and crops and homes devastated, about 1863. During much of this time he was on scout duty, and he well remembers seeing wild black bears in the streets of Nebraska City. On February 8, 1872, Mr. Cannon was married in Lincoln to Charlotte Young, a native of Mills county, Iowa, who came to Nebraska with her parents in 1857. In the spring of 1875, he returned, with his wife and two children, to Cass county and located on the farm, and they lived there several years. They spent the winter of 1883 and 1884 in California, and in the following June secured a homestead of one hundred and sixty acres of land, and a tree claim of the same size adjoining, on section thirty-one, township seventeen, range eighteen, which was their home until 1905, when Mr. Cannon retired from farm life, and located in Broken Bow, although he retains the ownership of his farm land. He has erected a modern home, and is one of the most prominent men in the city. In the fall of 1884, he was elected county supervisor, and served in that capacity several years, and in 1887, was elected to the state legislature, serving one term. He is now a member of the city council. In the early day he was instrumental in organizing a, school district in his neighborhood, which was given the number fifty-one, and for many years a member of the board. He has a valuable farm and other desirable property, and is highly respected for his abality [sic] and true worth. Five children were born to Mr. Cannon and wife, namely: Mabel, wife of F. J. Stewart, of Broken Bow; C. Elmer, of Custer county, a sketch of whom appears in this work; Ralph C., also living in Custer county a sketch of whom appears in this work; Cleon, of Broken Bow; and Joseph P., at home. Elmer has two children, and Ralph has three. Mr. Cannon is a member of C. C. Washburn Post, number ninety-eight, Grand Army of the Republic. Among the prominent old citizens of Niobrora, whose careers date back prior to the memorable flood of 1881, are the brothers above named, who have been associated through adversity and success during the greater part of their lives. They first landed in Niobrara in 1878, when it consisted of but twelve to fifteen buildings, most of these log huts and shanties of the rudest construction, and they immediately secured all the work they could do in their line, which was that of builders. After the flood, they helped move the buildings to the new townsite, and from then on, have erected the greater part of the residences and stores that have gone up in Niobrara. Both brothers were born in Wheeling, West Virginia, George in 1849, and Ben in 1851, and they grew to manhood in that city. They learned the carpenter's trade there, and in 1870 migrated west, spending three years in Avoca, Iowa, and latter living in other parts of Iowa. There they experienced the grasshopper raids, and Ben relates a tale of wading for half a mile through a veritable carpet of pests, the ground being so thickly covered with them that it was almost impossible to travel with any degree of speed. They saw a passenger train delayed for over an hour by their settling on the tracks so thickly that they acted like grease between the wheels and rails, and it was only after sanding the tracks and sweeping them off that the locomotive was finally gotten under way and pulled out. George Bayha left Avoca three years previous to Ben, and located at Dakota City, Nebraska, where he remained until joined by Ben. On leaving Dakota City, the brothers embarked at the old city of Covington, on the steamboat "Niobrara," as it left for its first trip of the season. The ice was so thick in the stream that the time consumed in making the journey from that point to Niobrara was seven days, which was a rather expensive venture for the management, who were required to feed the passengers during that time. After settling here, Messrs. Bayha had purchased a shop and dwelling, which they moved in 1881 to a block of lots which they also bought, in the western part of the new townsite. In their shop they had built a number of flatboats for use in the flood, which had been expected, and when the ice jam up the river broke and let the wall of water and floating ice rush down upon the town, these boats were taken out, and, by their use, many of the unfortunate settlers, whose homes stood on the low grounds, were rescued. floodtide of their hilarity. They also witnessed hail and sand storms, prairie fires and blizzards, and feel that they have passed through every phase of pioneer life in the west. In 1890, George Bayha was elected county treasurer, and Ben became his deputy, both serving for four years. The latter was appointed agent to the Ponca Indians, and served in that capacity for nine years. On completing his term, he returned to Niobrara for residence, where he has since remained. He was married, in 1894, to Hannah J. J. Cooley, and they have one daughter, Louisa R., who will graduate from the high school in 1912. They are members of the Episcopal church, and are popular in social circles of their city. In politcs [sic], the Bayha brothers are democrats. Both are Odd Fellows, and George is a member of the Masonic fraternity. At the present time he is serving as assessor of Knox county. Ben Bayha has held the office of justice of the peace since 1906, and has-also been United States commissioner for about two years. Among the early settlers of Merrick county, Nebraska, who have been identified with the growth of the financial and social, interests of that region, a prominent place is given the gentleman whose name appears at the head of this review. He has always been found ready to further the interests of the community where he chose his home, and has gained a wide and enviable reputation as a worthy citizen and substantial stock man of this section. Frederick K. Spires, son of George and Mary (Kingerley) Spires, was born in Wisbech, Cambridgeshire, England, April 17, 1862, and was third in a family of five children. He has one sister, Mrs. C. S. Purdy, residing in Clarks, Nebraska; one brother and one sister in England, and another sister, who is deceased. The parents are both living in the old home in England. Mr. Spires received his education in the home schools, and later engaged in railroading. On February 11, 1881, Mr. Spires was united in marriage to Miss Sarah Pentelow, at the home of her parents. In September, 1881, Mr. and Mrs. Spires came to America, locating in Auburn, New York, for seven months, then came to Merrick county, Nebraska, engaging in stock business, also farming, and here he has bred thoroughbred Shorthorn cattle exclusively for twenty years. His ranch is known as "Cedar Stock Farm." In 1907, Mr. Spires moved to Clarks, where he purchased three hundred acres adjoining the city limits, and built a good home, where they now live. Mr. and Mrs. Spires have had six children: Richard, deceased, August 2, 1896; George Frederick, Robert, Joseph, Ada and Clyde Harvey, all of whom reside under the parental roof. Mr. and Mrs. Spires are among the early settlers of the county. Mr. Spires is a prosperous man of affairs, progressive, and interested in all pertaining to the interest and welfare of his state and county. He has traveled widely; is a charter member of the local order, Platte Valley, number two hundred and seventy-seven, of Odd Fellows. He is also a charter member of local lodge number twelve hundred and twenty, Modern Woodmen of America, and also a charter member of Royal Highlanders. Mrs. Spires' parents live in England, as do also one brother and two sisters. She has one sister residing in Brown county, Nebraska. Another of the worthy sons of the northland, now residing in Nebraska, is Charles Ruden, the popular postmaster of Crofton. He is a native of Knox county, born March 16, 1871. He attened [sic] the country schools until old enough to begin in the Hartington schools, which he attended three years, from 1889 to 1891. He was employed in the Union Pacific railway headquarters for two years, in Omaha, and for two years was engaged in the lumber business in Bloomfield. He then spent one year at Allen, Nebraska, and two years on the road, collecting for the Edwards and Bradford Lumber Company. Four years were then spent in the implement business at Bloomfield. From the fall of 1900 to 1901, he engaged in farming, at which time he was elected county clerk, holding the position six years. During the latter part of his term, he was employed as cashier of the Farmers State Bank of Crofton. On May 5, 1908, he was appointed postmaster of Crofton, a position he has been filling to the satisfaction of the community he serves. Mr. Ruden is a son of Ole and Christine Ruden, natives of Sweden. The father came to America in 1867. He lived for two years in Carroll county, Illinois, and then settled on a homestead of one hundred and sixty acres, four miles west of where Crofton now stands. To this he added until he was the owner of four hundred acres of fine Knox county land. He died in the fall of 1902, at the age of sixty-eight. Charles Ruden's mother is still living, and resides with him and his sister, Mrs. Bleick, who lives at Bloomfield. Charles Ruden was married, May 5, 1897, to Miss Anna Buhrow, a native of Knox county, and daughter of John Buhrow, one of the earliest pioneers of Knox county, of whom we have written more at length elsewhere in this work. Four sons were born to Mr. and Mrs. Ruden: Dewey, Ralph, who met accidental death on the farm; Walter, and Daniel. Mr. Ruden is a staunch republican, and a prominent member of the blue lodge. of the Masonic order at Crofton, of the chapter and commandery at Bloomfield, and the Temple of the Mystc [sic] Shrine at Omaha. In the blizzard of October, 1880, Mr. Ruden was at school. His father came for him, and so severe was the storm, they were nearly lost. He and his sister were attending school in Hartington on January 12, 1888, and again had difficulty in finding their way home. Mr. Ruden has had a taste of pioneer life, a time when the country was open to the mountains of the west. For two year's the family lived in a dugout, as did most of the families in those days, and a snug and comfortable dwelling it proved to be. Niels Christensen, whose signal success as a farmer in Loup Fork precinct, Howard county, attest both the soundness of his principles and his industrious habits, is one of the sturdy Danes who left their native land to come to this country and carve out for themselves a home and competence, and, although passing through all the varied experiences of the early settler in Nebraska, he has become well-to-do, and also gained the respect and esteem of all with whom he came in contact. Mr. Christensen was born in Denmark on August 15, 1848, and is a son of Christian and Karn Marie Larson, the sixth member in a family of eight children. He grew up there, remaining at home with his parents until he was twenty-four years of age, then came to America, his first stopping place being Chicago, Illinois, where he spent about two years. In April, 1874, he arrived in Howard county, and took up homestead rights on section twenty-four, township thirteen, range twelve, which has been his home ever since. Here he has a fine estate of two hundred and fifty acres, improved with good buildings of all kinds, and engages extensively in the stock and grain raising business. Mr. Christensen was married in Howard county, May 21, 1880, to Mary Petersen, a native of Denmark also, who came to America in the same year as our subject. They have a family of thirteen children, all living except one son, Christen. The others are named as follows: Theodore, Jens Peter, Mary, Anna, Petrrea, Elmer, Otto, Peter, Christina, Eleonora, Thorwald and Carl. Mary and Anna are married, and, with their families, reside in Howard county. In the past years our subject has been a member of the school board in distirct [sic] number twenty-eight, and has done much to promote the best interests of his locality. He is now prosperous and successful, and is widely known as a pioneer settler of Howard county, having raised a fine family, and all are highly respected by their associates. Martin Casey, for many years a resident of section eighteen, township twenty-two, range three, Madison county, Nebraska, is a prosperous agriculturist, and commands the respect of a large circle of friends and acquaintances. He is a gentleman of untiring energy, and is possessed of sterling characteristics, and has prospered remarkably well in his chosen calling. Mr. Casey was born in Will county, Illinois, in the year 1860, a son of John and Ellen (Green) Casey, both natives of Ireland, who came to America at a very early date in a sailboat, and were on sea six weeks, finally settling in Illinois, where our subject was born, living there some few years. In 1879, our subject, with his parents, came to Madison county, Nebraska, where the father took up the homestead on which our subject now lives. Here he built a sod house, in which they lived many years, and during the first few years of residence on the western frontier, the family endured many hardships and privations, owing to the different causes of loss of crops by grasshoppers, storms, prairie fires, etc., and in the year 1894, the entire season's crops were burned almost to a crisp by the hot winds that were a result of the severe drouth of that year. Our subject and family were compellel [sic] to burn weeds and corn stalks for fuel many times, as wood and coal were almost an unheard of commodity. But those days have long since passed into history, and Mr. Casey is now well repaid for his endurance and industry, now owning three hundred and twenty acres of fine land, which has been steadily improved since being homesteaded. Mr. Casey, since his advent to this portion of the country, has proven himself a progressive and worthy citizen, and as such he is widely known. He has always taken an interest in the growth and best interests of his home county and state, and commands the respect and esteem of all..
in the spring of 1877, and joined his brother, Jules, at Wood River, Nebraska, and they came on to Custer county with a team and covered wagon. Another son, Louis Haumont, came to America in 1883, joining his brothers in Custer county, where he also became a homesteader. Jules Haumont received his education in his native country, and remained with his parents until July 7, 1875, when he sailed for America, landing in Philadelphia, July 25, 1875, and proceeding from there to Carroll, Iowa, where he found employment on the Northwestern railroad. Later he went to Moingona, Iowa, and worked in the coal mines. In the spring of 1879, in company with Joe and Mary Severyns (sister and brother), Mr. Haumont came by team to Hall county, Nebraska, stopping in the Wood river district, and in the fall of the year, he came on to Custer county, and secured a homestead on the northwest quarter of section thirty-four township eighteen, range nineteen, in September of that year. He was one of the original homesteaders on the tableland in Clear creek valley, and was at that time the only settler in that part of the county, with the exception of a few who had located in Round valley. He lived on that place until the spring of 1904, developing it into a high state of productiveness. In the fall of 1903, Mr. Haumont was elected county assessor for a term of four years, and after serving his term, entered the Security State Bank of Broken Bow, of which he has been vice president since its organization. In June, 1908, he received the appointment of postmaster of Broken Bow, and left his work in the bank to assume his new duties. He assisted in organizing Berwyn, State Bank in 1907, and was its first president, but resigned this office upon his present appointment. He is a republican in political views, and has in former years served on the county board and in various township offices. He has been deeply interested in educational matters, and for the past six years has been a member of the school board of the city, being its vice president at the present time. When Mr. Haumont first came to the county, Grand Island was his nearest trading point, and he relates how he and his brother, after building up their "soddy," prepared to put up their cook stove, which they had brought with them, had to put up a sod foundation about five feet high to bring the stove high enough so their pipe would reach through the roof, as pipe was then so high they had purchased but a few lengths. He has passed through many interesting experiences during his residence in Nebraska, and has always made the best of conditions, and adapted himself to circumstances in a manner to insure his ultimate success. Mr. Haumont was married in Broken Bow, May 16, 1889, to Mary Frischkorn, the ceremony being performed by the pastor of the Methodist Episcopal church. She is a daughter of Adam and Christina Frischkorn, natives of Germany, but early settlers of Custer county. Mrs. Haumont was born in Pennsylvania. The church known as Wesley Chapel, near Weissert postoffice, was the first building in Custer county used exclusively for religious purposes, being a sod edifice, but much admired in early days by those who had built it. Mrs. Haumont was one of those who helped in the organization of the church society, and she and her husband have always been prominent in religious, educational and social circles. They have four children: Christina Julia, wife of Edwin Myers, of Broken Bow; Mamie Ellen, Frank Joseph, and Edith Lucille, at home. The children were all born on the homestead farm. Fred Hilmer, a large land-owner of Howard county, Nebraska, has contributed in a large measure to the success of the farming region in that county, and is widely known and universally respected as all up-to-date agriculturist and worthy citizen. He is a man of large experience, and is possessed of good business judgment and integrity, which traits have placed him among the leaders of his precinct. successful by hard and faithful labor, taking advantage of every opportunity afforded the settler for gaining a competence. On May 14, 1882, Mr. Hilmer was married here in Howard county to Miss Lena Balliet, she also coming from one of Howard county's pioneer families. Peter Balliet, the father of Mrs. Hilmer, died in 1897, and her mother is still living, making her home in Wisconsin. Mr. and Mrs. Hilmer have a family of seven children, all living at home, and comprising a very interesting family group. They are named as follows: Henry, William, Fredie, Alice, Elmer, Lizzie and Eddie. On another page will be found portraits of Mr. and Mrs. Hilmer. Mr. Hilmer has been a member of the school board of district number twenty-five for a great number of years. In May, 1907, he was appointed to fill a vacancy as county commissioner, and in the fall of that year, was elected for the ensuing term. In the fall of 1910, he was, without opposition, re-elected, holding that position at the present time (1911). He has never sought public office, and in this instance was put in the position almost against his will, although the county has never had a more faithful or efficient man to fill the office. Mr. and Mrs. Fred Hilmer. Among the prosperous farmers and early settlers of Pierce county, Nebraska, the subject of this review, George Friederich, occupies a high position. He resides in Willow precinct, where he has a fine farm and comfortable home, and is highly esteemed by all who know him. He has spent much of his life in this region, in fact, some thirty years, where he has devoted his energies to the interest and welfare of his locality. Mr. Friederich was born, November 8, 1861, in LaCrosse, Wisconsin, and is the son of Theodor and Katherine Elizabeth (Pilger) Friederich. The father of our subject was a native of the province of Nassau, Germany, coming to America from Baden in the early forties, taking passage on a sailboat from Hamburg, the voyage lasting some eight weeks. He was a carpenter by occupation, and worked at the trade in New York two or three years before migrating to Wisconsin, where he continued in that vocation, and later farmed for six or seven years. He died at the age of eighty-three years, and the mother died at the age of fifty-nine years. Our subject came from LaCrosse, Wisconsin, to Pierce county, Nebraska, in the spring of 1880, driving from Norfolk to his homestead, on which he built a shack, eight by ten feet. Later he took up a tree claim, and he has added to his land until he now has six hundred and forty acres--three quarters in section twenty-two, and one quarter in section twenty-four. Mr. Friederich was united in marriage in 1886 to Miss Martha Klitzke, to this union eight children have been born: Adolph, Louise, Herbert, Fedora, Elsa, Ada, George and Josephine. 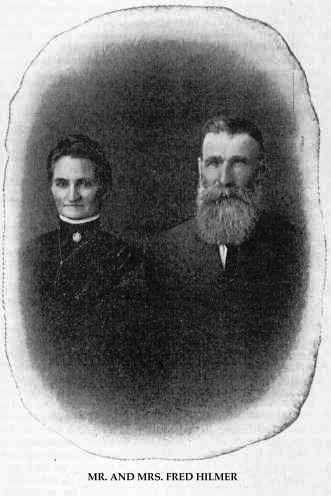 Mrs, Friederich's father and mother, William and Amelia (Mix) Klitzke, homesteaded in 1874, in section twenty-two, township twenty-six, range four, driving from Wisner to the claim. Mr. Friederich experienced the hardships and inconveniences common in the early days. He burned hay for fuel two or three years, as well as corn when that product was cheap and coal was high. Deer and antelope were plentiful on the prairies, and were to be seen herding with the cattle at times. Mr. Friederich is a prosperous farmer, and has a well-improved farm. In 1890 he built a commodious house of nine rooms. He is a member of the Knights of Pythias and the Modern Woodmen of America, and votes the republican ticket. A prominent place among the list of prosperous and energetic farmers of Howard county is accorded the gentleman above, who for many years has been closely identified with the agricultural interests of Loup Fork precinct, and there conducts a farm. Soren Nielsen is a native of Denmark, born July 5, 1850, and is a son of Niels and Stenie Sorensen, being the eldest of four children born to them. At the age of twenty-two years, our subject started alone for the new world to make his fortune, arriving here in May, and going first to Wisconsin, where he spent about a year and a half, then coming to Howard county, Nebraska. He immediately filed on pre-emption rights in section two, township thirteen, range twelve, afterwards taking the same land as a homestead of eighty acres. He still lives on the original claim, which he has built up in good shape, adding to it eighty acres, and now has a fine farm and home, engaging in mixed farming and stockraising. Mr. Nielsen was united in marriage at Grand island, Nebraska, on August 22, 1876, to Hannah Svirgaarg, and to them have been born six children, named as follows: Stenie, who married Walter Erickson, parents of two children, and living in Elba; Annie, wife of Ivor Lyehn, having two children, residing in Howard county; Jens, married, having two children, and living in South Dakota; Niels, at home; Hans, now in Kearney, Nebraska; and Mary, living at home. Mrs. Nielsen died on the home farm, February 20, 1889. Mr. Nielsen has been a member of the school hoard of district number sixty-two for a number of years. He has always been active in the general affairs of his county and state, and stands for the best interests of the people of his region. Daniel Benson, deceased, was for many years one of the most prominent and prosperous farmers in Nebraska. He was one of the early settlers of the state, and his fine farm in Greeley county is evidence of his untiring perseverance, industry and good management. He was one of the best known men in this section of the state, and commanded the respect and esteem of all who knew him. Mr. Benson was born in Oneida county, New York, on October 31, 1849. He was the second in a family of six children born to Daniel G. and in Illinois in 1861 [sic], where he received the usual, educational advantages. The civil war was raging at this time, however, and in 1862 he enlisted in Company G, Ninety-sixth. Illinois Infantry, and served until the close of the war, receiving his discharge at Rockford in 1865. He was in many minor engagements, some of them being mere skirmishes. However, during the battle of Chickamauga, he was wounded and taken prisoner. Later on, he was able to take part in the battle of Lookout Mountain. After the war was over, he returned to the Illinois home, and on December 26, the same year, was married to Miss Mary Louisa Shatswell, a native of that state. In 1869, Mr. Benson; with his wife and two little daughters, came to Platte county, Nebraska, where he pre-empted a quarter section near Genoa. The family resided here for about four years, and in 1873, moved to Greeley county, where he homesteaded another quarter section, which remained his home until the time of his death, February 2, 1899. He was survived by his wife and seven children: Minerva (Mrs. J. A. Jeffres), Kate (Mrs. Geo. Jeffres), Ida M. (Mrs. H. S. Conway), Roy E. and Leslie J., who are twins; William W., and Cornelius. Mr. Benson was a man of broad mind, and had a host of friends who mourned his death. He was treasurer of his school district for several years, and was a man of progressive, active public spirit. After Mr. Benson's death, Mrs. Benson left the farm, and moved to North Loup, where she purchased a good home, in which she is still living, surrounded by a loving family and devoted friends. She herself comes from a patriotic family, as her father and three brothers served all through the civil war in the Fifteenth Illinois Infantry. Two of the brothers and her father spent about nine months in the infamous Andersonville prison. Her family history can easily be traced back to 1633, when John and Johanna Shatswell came from England, and settled in Massachusetts. The land upon which they settled first when coming to this country, has never been out of the possession of the family, one of their number being the present owner. Mrs. Benson has in her possession a copy of the original coat of arms of the Shatswell family of England. Mrs. Benson can tell many anecdotes of the early settlement of this region, and boasts that her homestead was the scene of the first wedding in Greeley county, in 1874, the contracting parties being Aaron Bradt and Clara Harlow. Another story sometimes told refers to a terrific storm during the seventies, when little Ida, one of the children, was blown away. Six hours later the child was found unconscious, but, luckily, she suffered no serious or permanent injury. Isaac W. King, son of Isaac W. and Amanda (Gifford) King, was born in Saratoga county, New York state, January 17, 1840. He was second in a family of thirteen children, nine of whom are living: Two sisters in the state of Washington, one in Oregon, one in Nebraska, and two brothers reside in Newman Grove, Nebraska, one in Black Hills, Dakota, and another in Canada. The father died, January 28, 1897, and the mother lives in Oregon at the advanced age of eighty-nine years. In 1844, Mr. King went with his parents to Wisconsin, from whence, three years later, the family went to Iowa, and in 1860 again moved, this time to Minnesota, engaging in farming, returning in a couple of years to Iowa. In October of the year 1861, Mr. King enlisted in Company C, of the Twelfth Iowa Infantry. In January, 1863, he re-enlisted in the same regiment and company, serving all during the war, and received his honorable discharge at Davenport, Iowa, in January of 1866. The important battles he engaged in were: Fort Henry, Fort Donaldson; Shiloh, wounded here, and held prisoner for forty-one days; Jackson, Mississippi; Vicksburg, a siege of forty days; second battle at Jackson; Brandon, Mississippi; Mobile, Alabama; Selina, Alabama; Corinth, Mississippi; Holly Spring, Mississippi; Red River, and many other minor engagements and skirmishes. After the war, Mr. King returned to Iowa, and on July 22, 1866, was married to Miss Mary C. Russel, of Iowa, to whom two children were born: William H., who is married, and has two children, and lives in Madison county, one and a half miles West of Newman Grove; and Nellie M., married to Albert Patrick and lives in Kearney, Nebraska. In the fall of 1869, the family came to Nebraska, locating in Stanton county, homesteading one hundred and sixty acres, where they lived nine years. Mrs. King died, January 17, 1874, survived by her husband and two children. In 1878, Mr. King sold the homestead, and moved to Madison county, where he purchased four hundred acres of land, nine miles northeast of Newman Grove, and took up a timber claim of one hundred and sixty acres in section twenty. four, township twenty-two, range three.